How Good Are My Eggs? Laurel and I have been raising chickens for a few yews now. At first it was a few hens but as the years went by we added to the flock. We added enough hens where we became overrun with eggs. Laurel and I were having trouble eating 12-18 eggs a day. Who needs that much protein. Laurel started marketing our eggs. 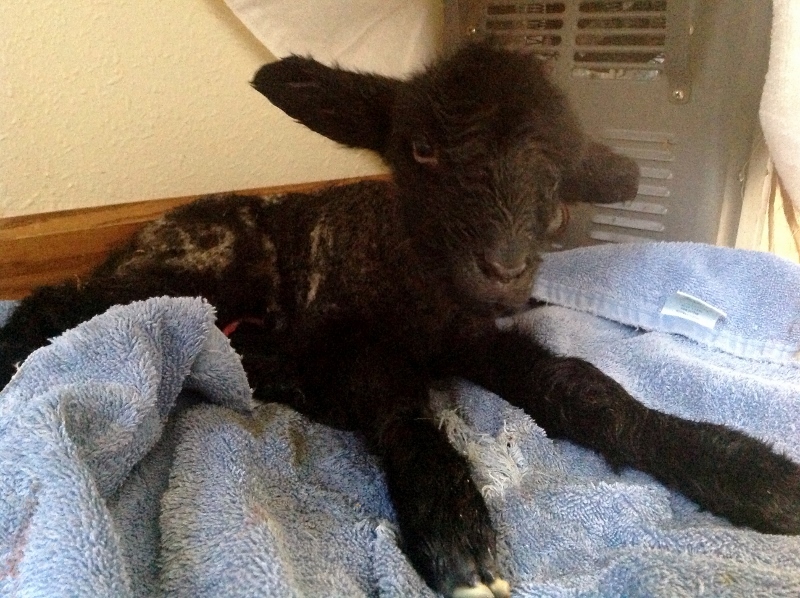 She found a couple clients at the vet clinic where she worked interested in buying some of our overrun. The summers were easier to fill the orders but winter would leave us finding it hard to fill our own needs. A couple of our main customers comment on how good our eggs taste. They have told me that our eggs are better than the eggs from the local food co-op. Really! They’re better? 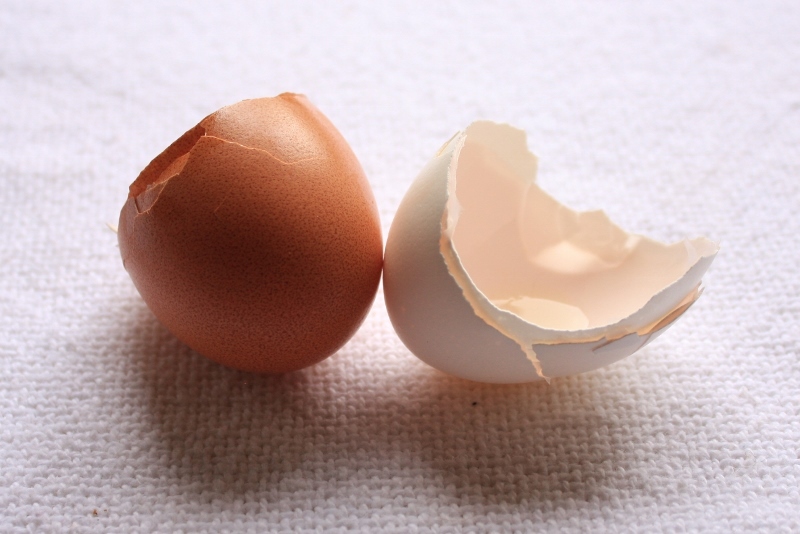 What are we doing different than the suppliers of eggs to the food co-op? We have a mishmash batch of colorful bird. If there was a dominant breed I guess it would have to be the Araucana. Sometimes known as the Easter Egg chickens. Chickens that lay eggs in colors ranging from blue and greens to pinks. We also have several breeds of brown egg layers. So each carton will contain 3-4 green eggs and the rest made up of several shades of brown. I have been reading several blogs on agriculture and listing to podcasts over the past year plus. The agriculture blogs cover organic farming to conventional farming. Podcasts are on subjects covering organic living. Some of the comments have lead me to do an experiment on my own eggs. 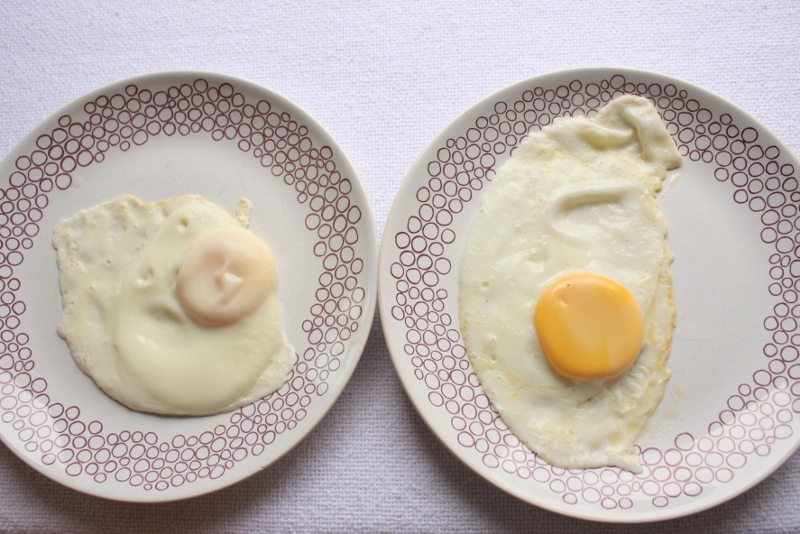 The basic question is, “Are my eggs better than the store bought eggs?” Can you see a difference? Can you taste a difference? I know they’re better, that’s because there from my chickens! That’s a little pride talking. But really that much better you can taste and see a difference? So here’s the challenge. Take some photos, make some observations, cook two eggs and taste the difference. As I awoke this morning the rain had just stopped and the sky was heavily overcast. From a photography point, the photos would have few shadows . I opened the basement door and put a stand in the doorway so the eggs would receive natural lighting from the great outdoors. The eggs for the challenge, one was from the chicken coop plucked from the nest the night before. The challenger from the egg cooler at the local Wal-Mart. First I selected two glass custard cup and cracked an egg in each cup. I took a close observation of each egg. 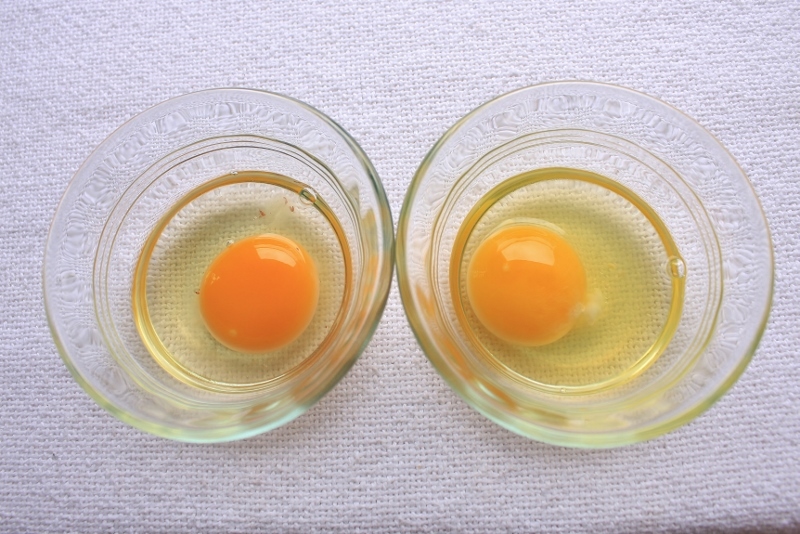 The Wal-Mart egg had a slight lighter yellow color to the yoke and the white had an amber tone. The coop egg also had a few small red specks because we have a rooster running with the hens. If your eyes can’t tell the difference, The coop egg is on the left. Second I took the eggs upstairs to the kitchen and introduce them to the stove and pan. I warmed the pan and added a little butter and slipped each egg into the pan. I added a few tablespoons of water and put the cover on the pan for about 3-4 minutes. I lifted the eggs out of the pan and placed them on a plate. Back down the stairs to the photo table for some more photos. Now the coop egg is on the right. The white spread more in the pan and did not cover the yoke when it was cooking. The I cut into the yokes to expose the yokes and couldn’t see any difference. But in the photo, the coop egg seems to have a darker yoke. The coop egg is still on the right. Now the taste test. That is why our customers buy our eggs. They just taste better! I have the taste buds of a hungry wolf. So unless there is a overwhelming difference I will have just had breakfast. 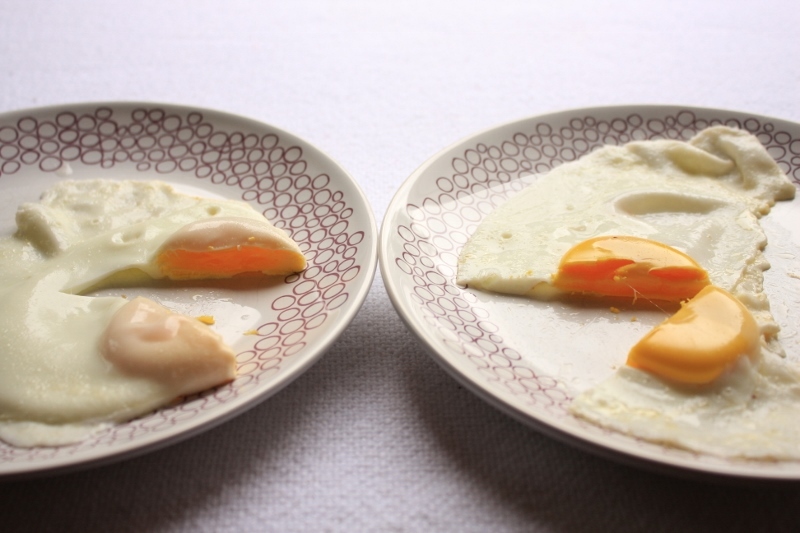 A piece of one egg then the other. Then egg two and back to egg one. One-Two, Two-One. All gone and no decision. If it would have been a blind test, a flip of the coin would have been my decision. I have had people say we have the greatest organic eggs. I am quick to stop them mid sentence. Our eggs are not organic. The feed comes from the local feed mill. Corn and soybean meal are blended together along with vitamins. The corn is from the grain bin. Is it organic corn? Probably not and with a high probability of it being GMO corn. The soybean meal, again probability GMO soybeans. So what is different? Well the chicken are aloud to run free. When I say “FREE” I mean the sheep barnyard. Access to sheep manure, compost pile, weeds, bugs and worms. They also have access to a pasture of white clove and a wood.. They also get first pick of the kitchen compost scrapes and right now skins and seeds from tomatoes crop we are canning. This test was totally unofficial and my taste buds were the judge. If you buy my eggs, Thank You. If you buy eggs from a local producer in your area, they thank you also. I hope you buy your eggs because you believe in me, Laurel and other producers and our management of our flocks. I guess tomorrow it will be eggs for breakfast. I have plenty of fresh eggs from the coop. Why did I start this blog? I blame it on the “Urban Chickens of Seattle”! Here’s my story and I am going to stick to it. 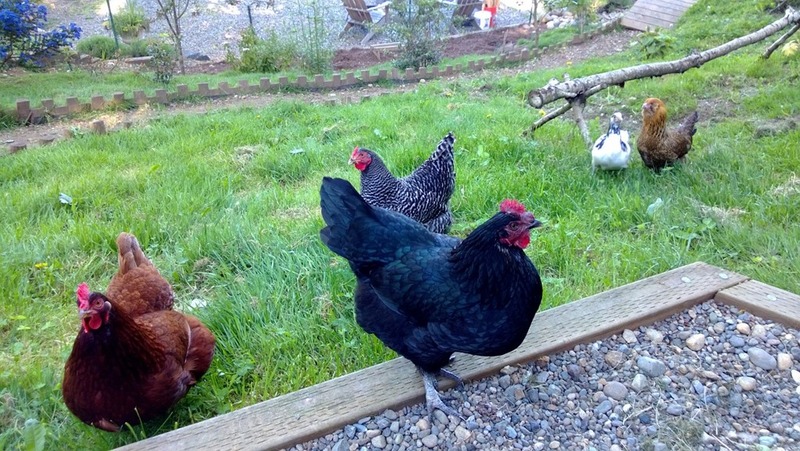 Back on May 10, 2013 my brother-in-law Joe posted a picture on Facebook of his urban chickens. The photo was linked to a web site photo challenge.org and week 18’s challenge was Agriculture. As I looked at the photo I started thinking, I have chickens, I have sheep and I have goats. Why don’t I go out and take a photo of my animals and submit a photo? Well, I joined their group and submitted my photo. As I looked around the photo challenge web site I saw a tab about “guidelines” of the group, I clicked on it and started reading. It stated each photographer should have a blog talking about their photography and be able to have interaction with others. Yikes, I need to start a blog! What am I going to say? I’m not big on reading and don’t care to write. So this was going to be a new challenge for me in my life. With Joe being on WordPress.com I decided to set up a blog there too. What have I gotten myself into? On June 24th I sent out this first blog posting. This is my first attempt at blogging. I don’t know where it will take me, but I am looking forward to the adventure. Then I started looking inside of me and finding stories I wanted to share with the readers of WordPress. I also started adventuring around the WordPress web site and found the search area and entered in the key words weight lose, photography and agriculture. These are areas of interest of mine. Bingo! A young ladies blog caught my attention. [j l d] Photography and it hooked me. She wrote about her Sunflower Farmer, North Dakota agriculture and her upcoming marriage. I looked at who’s blogs she followed and it lead me to other blogs I found interesting. Yes, a friend of a friend of a friend blogging travels and more people and lives to explore. In my tagline I state, “Learning to tell a story”. So I wanted to explore if I can tell a story thru my writings and photography. In 2009, Laurel and I along with some family members went to Ireland for a little touring. I told my co-workers before we left, legend has it if you kiss the Blarney Stone it will give you the gift of gab. My co-workers were horrified and wondered if it would be a curse on me if I kissed the stone. We never made it to Blarney Castle and so the legend is still a mystery and alive. But maybe WordPress will give me the medium for the gift of gab. It will be an interesting adventure for me. I hope to share photos, stories of my family and mundane stories of day to day life in Wisconsin. And just think, it all started with a photo of Urban Chickens in Seattle.